Good day everyone! The last few weeks has been an exciting one, what with the change the country is going through for the first time in a very very long time. 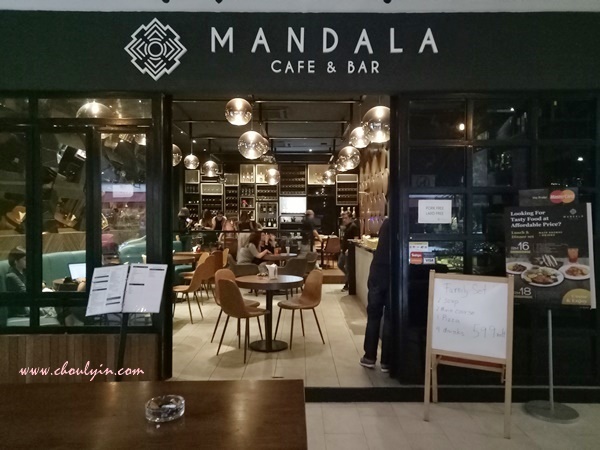 But, even with all these changes, we've still got to eat, and today I'm going to share with you this wonderful food place I've just recently discovered, and that's MANDALA Cafe & Bar in Publika Shopping Gallery. 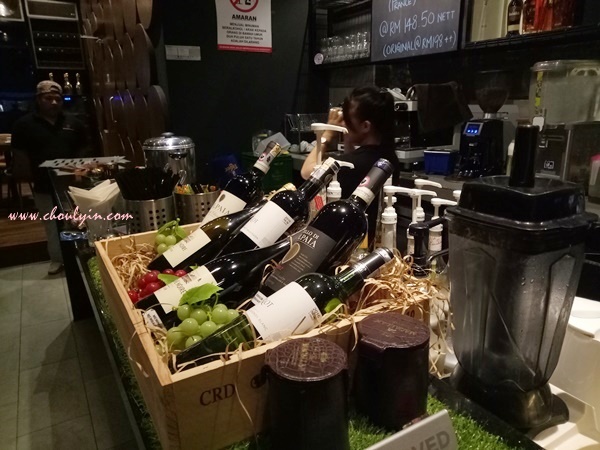 If you're a regular in Publika, you will definitely have seen this Wine Bar, tastefully done up and beautifully decorated, providing a refuge against the hustle and bustle of the work and weekend crowd. If you've never been inside, you should make a trip there because they have an amazing selection of wines, be it reds or whites, there is a wine for everyone. Just look at their 'wine cellar'. Filled to the brim with Wine from every region. They've got selections from Italy, France, Australia, amongst others. All you need to do is just ask their staff and they will gladly suggest one that will suit what you're looking for. 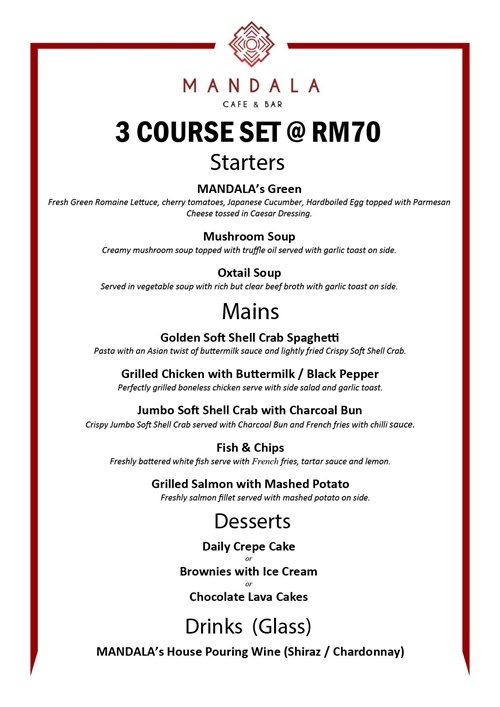 And if you're someone who prefers to have your wine as a meal accompaniment, now is definitely the time to go, as they have just launched their “3 Course Set @ RM70”. So what do you get for a three course meal? You get a starter, main, and dessert, together with a glass of their house pouring wine. This set is valid daily from 6pm to 12am. So if you don't have time to head there on weekdays, don't worry because you can still enjoy this on weekends! Their house pouring wine is from the Australia region, Chardonnay and Shiraz. 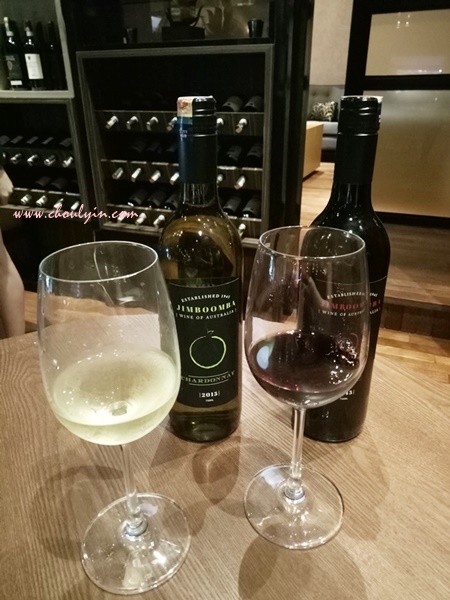 I've tried both the red and the white, and it is very smooth wine. It has a low acidity level, and goes down really well with the mains in their set menu. A snapshot of their starters in the set menu offering, clockwise from top left: Oxtail Soup, MANDALA's Green, and Mushroom Soup. If you love beef, I would recommend the oxtail soup. It has a very rich taste from the marrow, and it is very evident that the soup has been simmering for a long time, and all the flavour from the oxtail is already infused with the soup, making every spoonful a delight to the tastebuds. The MANDALA's Greens itself is a simple salad, full of vegetable goodness, with a generous serving of carrots, lettuce, cucumber, big onions, cherry tomatoes and boiled eggs. The salad is served with a sesame dressing, and is a refreshing add on to anyone who prefers a healthier option. 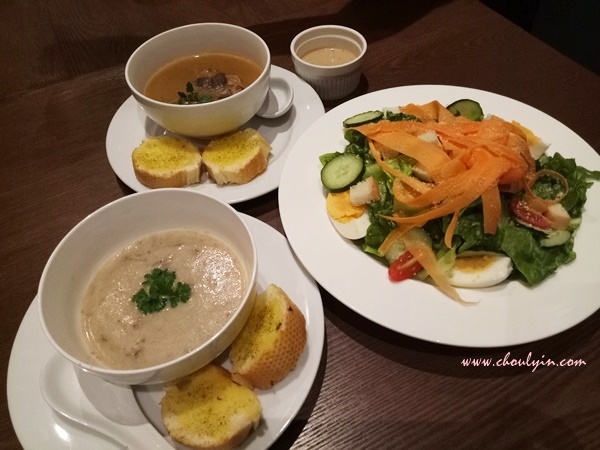 Truthfully, there is no faulting their starters as their mushroom soup is also flavourful and comes with mushroom chunks in every spoonful. They did not skim on the ingredients, and I would go back just for the starters. You are free to choose which starter, main, and dessert to have, as well as the selected wine to pair your meal with. Featured here is the Grilled Chicken with Buttermilk Sauce. 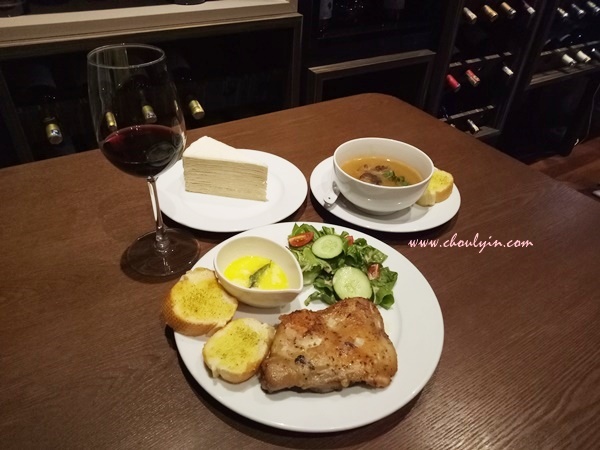 Perfectly grilled boneless chicken served with a side salad and garlic toast. The chicken was very succulent and grilled to perfection. It was perfectly cooked all around, with the meat still tender and silky. The buttermilk sauce was also very rich, and brought out the grilled flavour in the chicken. Another main on offer in the set is Fish & Chips, freshly battered white fish served with French Fries, tartar sauce, and a wedge of lemon. 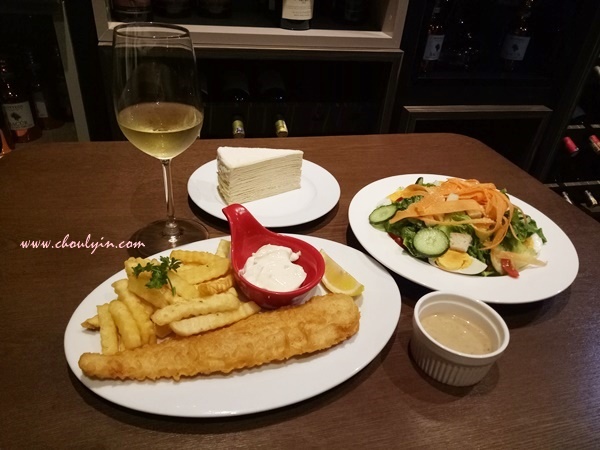 I would venture that the white fish is dory fish, and it was very tender and soft to the bite. The batter was crispy, but not overly done, which gives it a balanced bite between crunchy and soft when biting into the fish. Complemented with the lemon juice and tartar sauce, it was the perfect accompaniment to complete the dish. 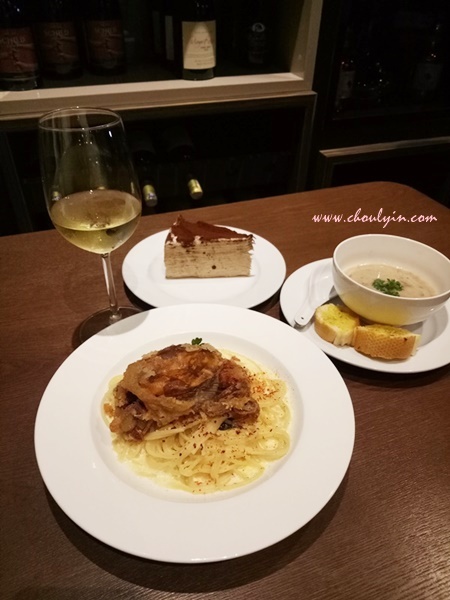 Thirdly, the Golden Soft Shell Crab Spaghetti, effectively pasta with an Asian twist of buttermilk sauce and lightly fried crispy Soft Shell Crab. Do not be confused with the carbonara sauce, which is cream sauce. The sauce used for this dish is buttermilk, which gives it a sweeter taste than the normal carbonara sauce. Coupled with the lightly salted fried Soft Sheel Crab, the dish is elevated to another level, because it gives an additional depth of flavour. If you're a pasta lover, be sure to give this a try. 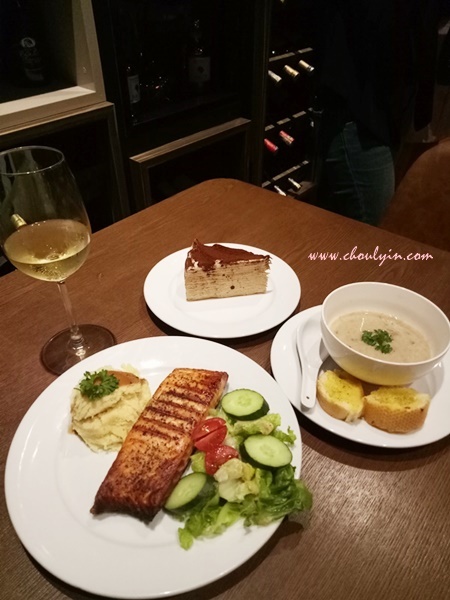 Another seafood dish in the mains is the Grilled Salmon with Mashed Potato, a freshly grilled salmon fillet with a side of salad and mashed potato. With salmon, a lot of care has to be taken into cooking the fish to ensure that it is not overcooked, otherwise it will be dry and tough to eat. But this was grilled very well, with a tender bite. Of course, with every salmon dish, one hopes that the salmon skin is crispy and lightly salted. And this one does not disappoint. 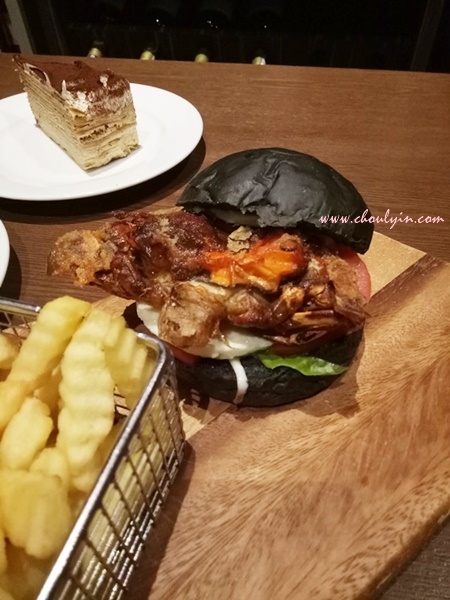 Last on the list of mains is the Jumbo Soft Shell Crab with Charcoal Bun. This main is served with French Fries, and chili sauce. Similar to the Pasta dish, the Soft Shell Crab is lightly salted and fried. The bun is soft and fluffy, and has a generous helping of lettuce, tomato, and big onions. All in all, this is a dish to be tucked into with your hands. 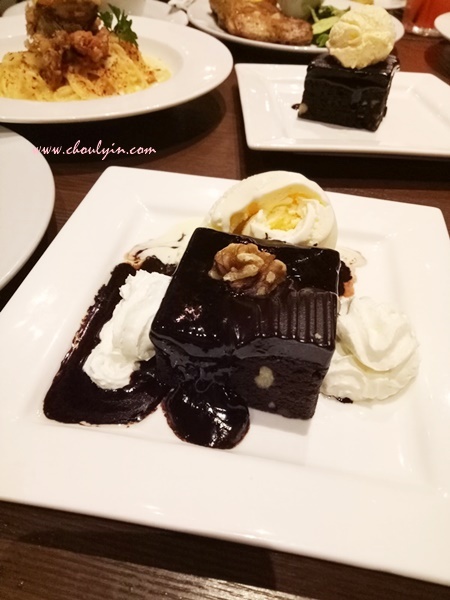 Each set menu comes with a dessert of your choice, and you are free to choose from the daily crepe of the day, chocolate lava cake, and brownies with ice cream. I must say, the lava cake and brownies are decadently rich in chocolate, and all of us went back for morsel after morsel. Even though we were full from all the dishes we had, we somehow managed to finish even the dessert. Each chocolate cake and brownie comes with a scoop of vanilla ice cream, and whipped cream. Talk about sinful! 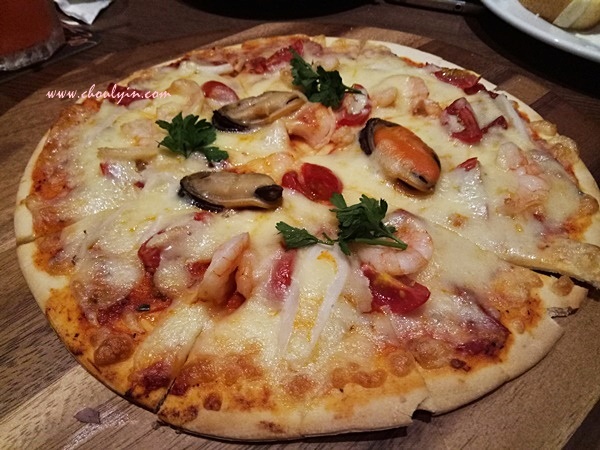 An additional dish that was not included in the set meal was the Seafood Pizza. Everything about this pizza is handmade, with a superb Italian crust, and generous amount of tomato sauce and cheese. 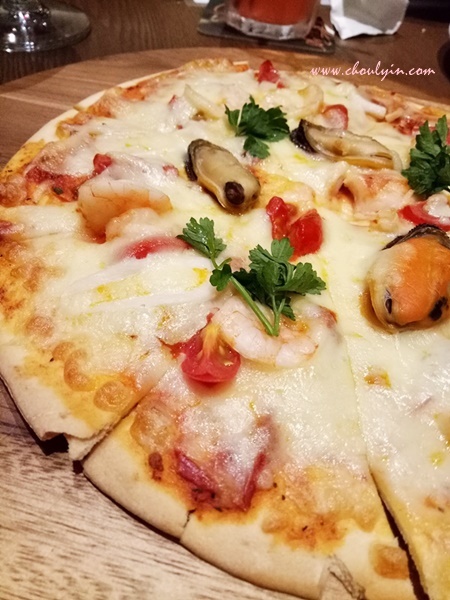 The seafood toppings on the pizza was fresh as well. 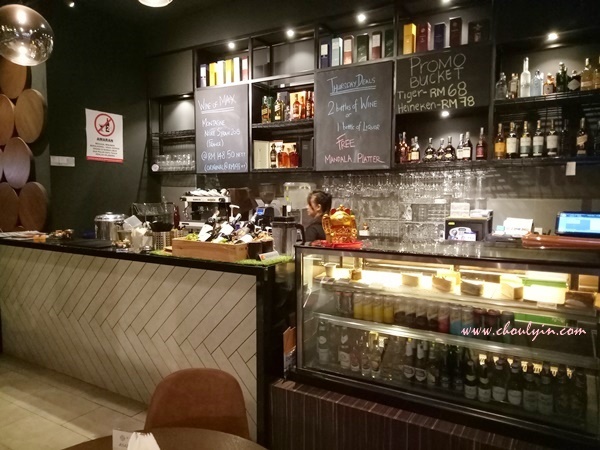 Despite being a relatively new place, MANDALA offers a very cosy environment, and I can see myself spending time at the place even just by myself. With a coffee in the morning and a glass of wine in the evening to unwind, this place is heaven! 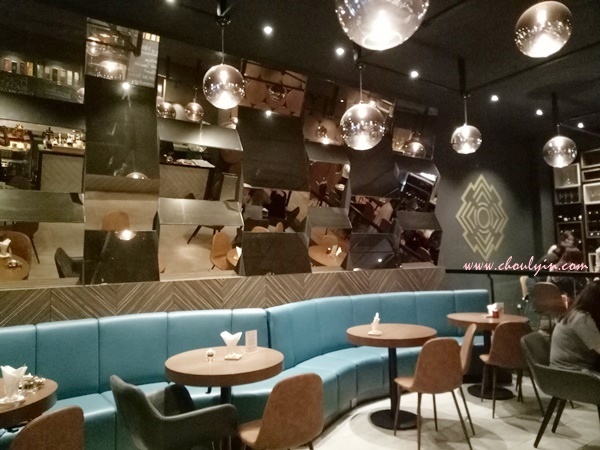 The seating area is openly spread out, and there is ample seating for each table so that you don't accidentally hit the other person from the table across or behind you. 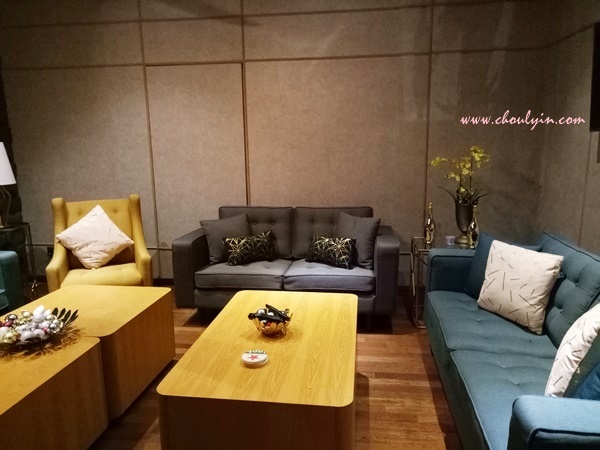 Everything about the place exudes comfortability so you can have meetings and discussions with your clients. 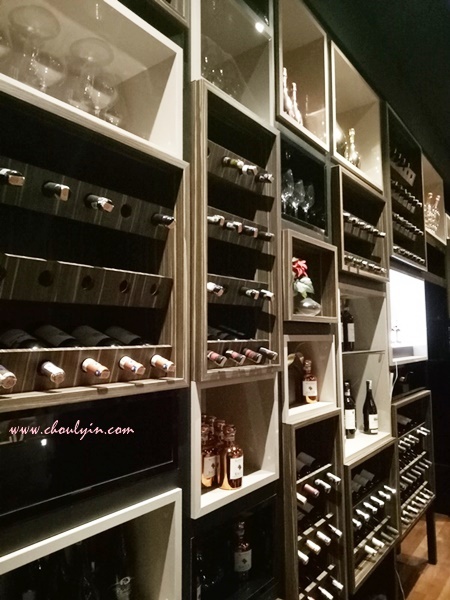 The wine bar also provides a nice ambience, suitable for events and parties. 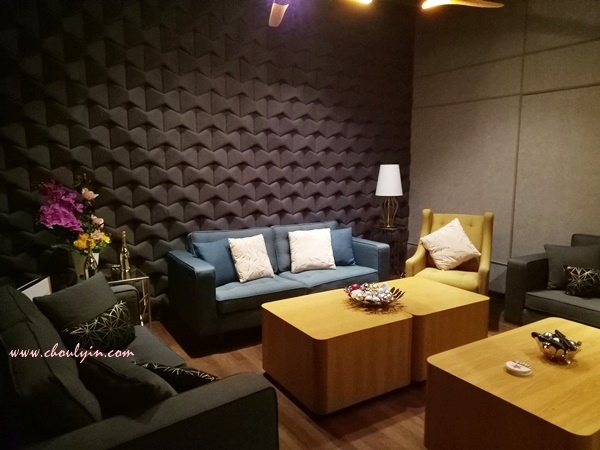 And speaking of parties, MANDALA provides a VIP room which can fit approximately 10 persons. For a minimum spend, you will be able to have full use of the room. The room is really beautiful and cosy, I half wished I was in that room myself. This is the view from the other end, with sofas and throw pillows for a perfect gathering with friends and family. All in all, I quite enjoyed my time at MANDALA, and it is easy to see why so many celebrities like Datuk Jimmy Choo and Datuk Wira Lee Chong Wei also visited MANDALA. Address: D3-G3-8, Solaris Dutamas, No.1, Jalan Dutamas 1.